Oh my! 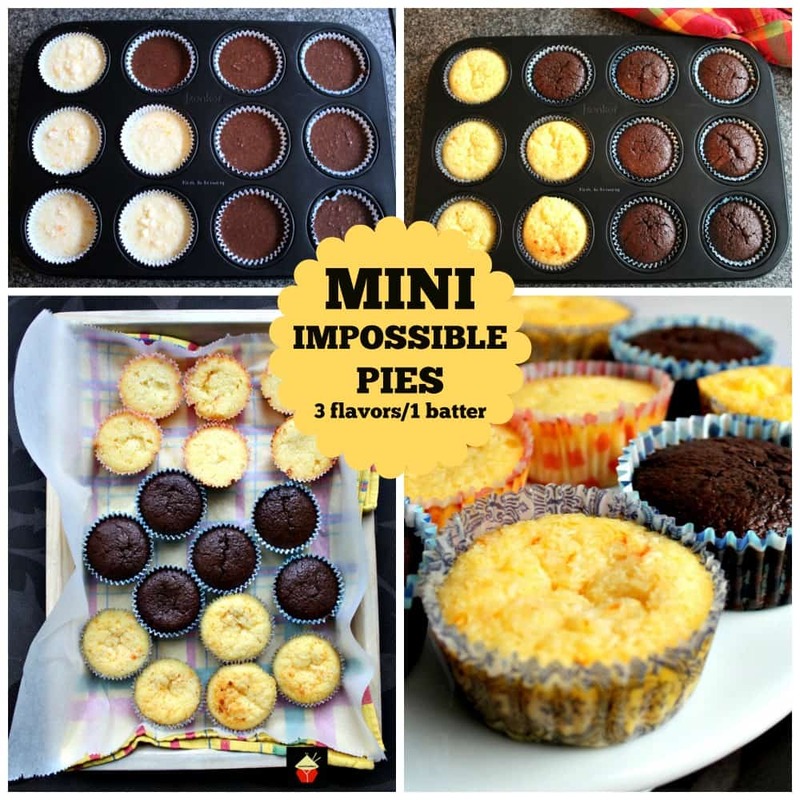 Mini Impossible Pies are simply THE BEST! If you have a party of a family who all like different things, then this is the recipe for you! It’s great for Pot Lucks, Game day, Christmas, Easter, and all kinds of occasions, as well as just a regular week day treat. I’ve made the recipe super easy with very little fuss, so in essence, I have used 1 batter mixture and simply divided it in to 3 bowls and added some different flavors. For this recipe, I made Chocolate, Orange and Plain Mini Impossible Pies. You can of course do your own thing and play around a bit, add some other flavors like lemon, almond, or simply stick to the flavors I’ve used here. These little pies are really easy to transport, just pop them in a tupperware. They won’t smash or get messed. You can make them a day before and refrigerate. Choose some pretty cupcake holders to add an extra party theme, or remove the cupcake holders when serving. Really, this is so flexible! For those who have never tried an Impossible Pie before, you simply must! In a nutshell, it’s an egg custard type mixture with a few additions. When it bakes, it forms its own bottom crust (which has the texture of pastry) and also forms a crisp top crust. During baking, the coconut rises to the surface and that is what forms the crisp top layer. Once you’ve baked these pies, it is a good idea to have them chill overnight so they have time to set, it is easier to remove the paper and also the flavours come together better. If you try to remove the cupcake paper when they’re still hot, you will end up with messy pies, so make sure you do let it set! I hope you enjoy this as much as we do. It would make a perfect choice for a party or pot lucks, Thanksgiving and holidays. Please enjoy! 1. Mix all the ingredients listed for the Basic Impossible Pie in a bowl using a spoon or hand whisk. 2. Divide the batter in to 3 bowls. In one bowl, add the grated orange zest and juice, in another bowl, add the melted chocolate. (To melt the chocolate, pop in the microwave at 30 second intervals until all melted). The 3rd bowl will stay as the plain Impossible Pie. Give the batter a mix again. 3. 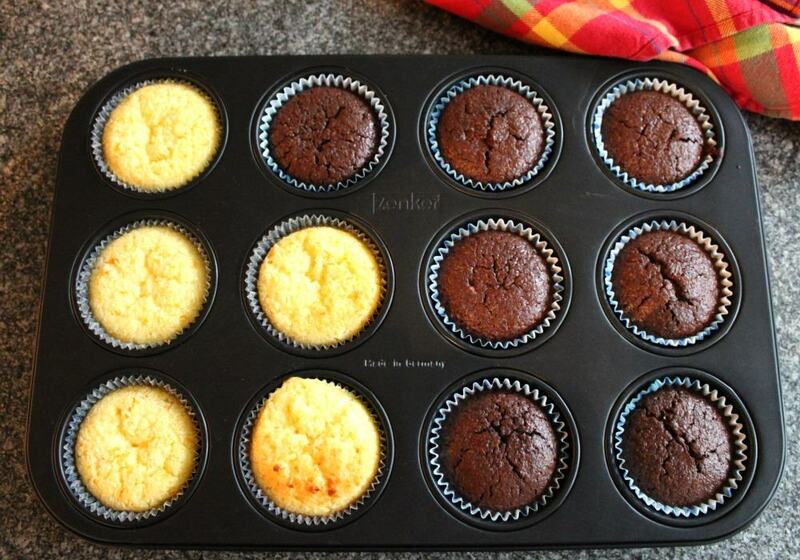 Pour into Cupcake lined baking pans. 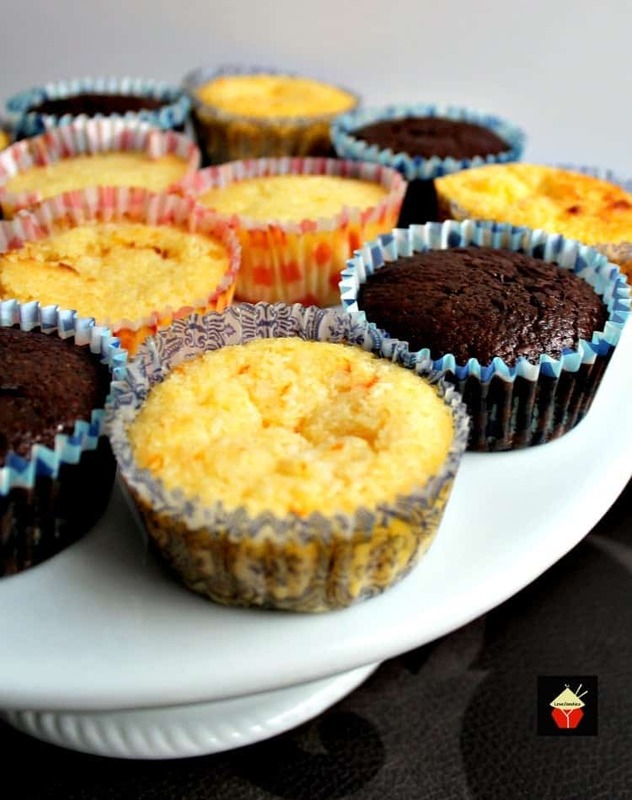 You should get around 20 – 21 cupcakes from this recipe. Bake 350 F or 180 C or Gas 4 oven for 17 minutes. 4. When done, the pies will be slightly wobbly in the center. Remove from the oven and allow to cool, then refrigerate overnight if possible. To remove the mini pies from the paper, peel away the sides first, and if you see the bottom crust is catching to the bottom of the paper, take a knife and loosen the base. (I found the base stick to a few as I removed the pies from the paper). Serve on their own or with a blob of vanilla ice cream! 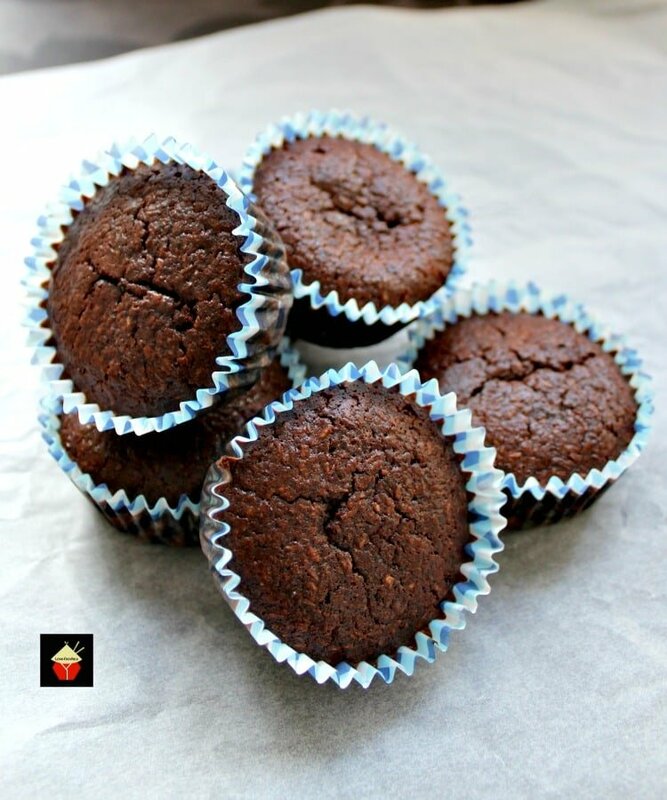 Follow our Pinterest board !Lovefoodies All Things Desserts! on Pinterest. Mix all the ingredients listed for the Basic Impossible Pie in a bowl using a spoon or hand whisk. Divide the batter in to 3 bowls. In one bowl, add the grated orange zest and juice, in another bowl, add the melted chocolate. (To melt the chocolate, pop in the microwave at 30 second intervals until all melted). The 3rd bowl will stay as the plain Impossible Pie. Give the batter a mix again. Pour into Cupcake lined baking pans. 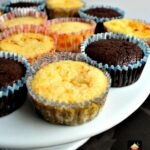 You should get around 20 - 21 cupcakes from this recipe. Bake 350 F or 180 C or Gas 4 oven for 17 minutes. When done, the pies will be slightly wobbly in the center. Remove from the oven and allow to cool, then refrigerate overnight if possible. 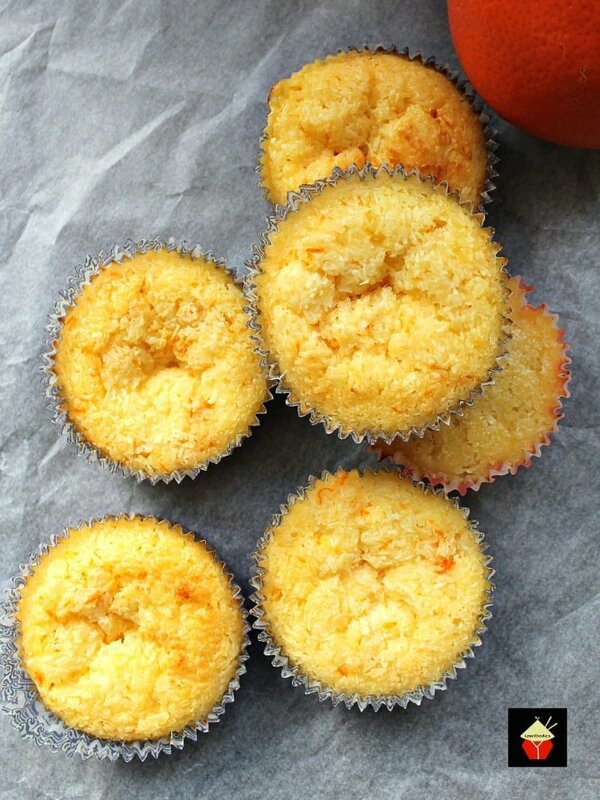 I don’t have all the ingredients to make these but don’t have muffin cups. A greased and floured pie plate is used for the larger pie version; do you think these will work if I grease and flour the muffin tins? Hi Kate, it should be fine, just make sure you grease and flour the sides too because they can stick. Please enjoy! 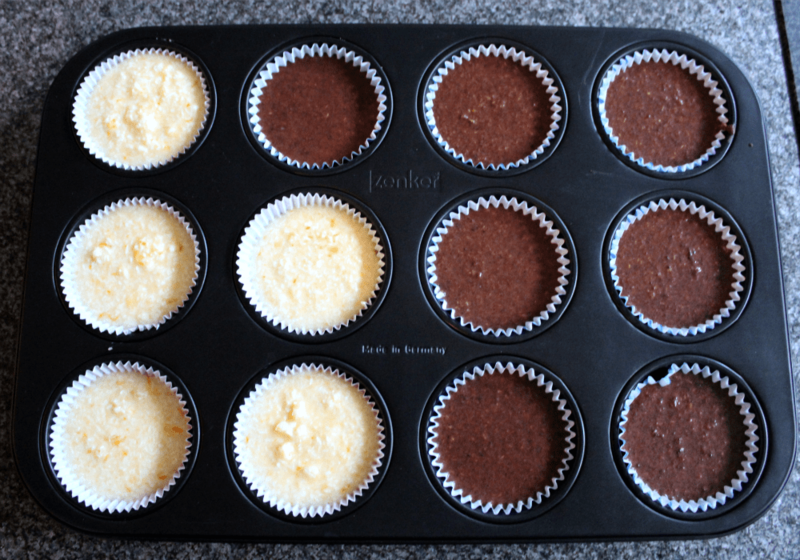 Were your cupcake pans the regular size or did you use the larger muffin size? Can I use almond milk in place of the milk? Hi Cheri, either is fine. You have 8T of melted butter in the pie recipe and 5T in the mini pie recipe. Why the difference? Hi Kathy! Well spotted! 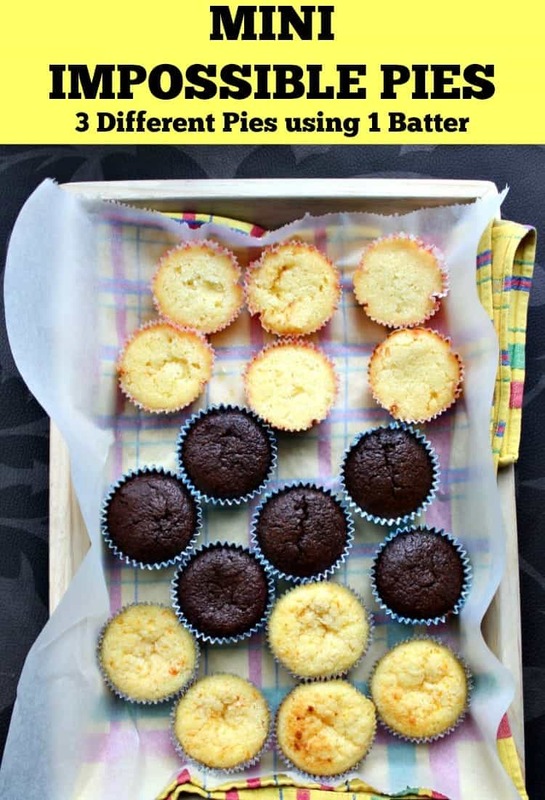 I reduced the butter quantity for this recipe because I simply found them far too greasy in the paper cups I had used, so I made them again with 5 Tblsp. and that worked much better. Hope that clarifies! So delicious! Mine rose a bit then sunk in the middle. Still tasted great though. Is the coconut just in there for flavoring or is it a necessary ingredient to form the crust? Not everyone at home likes coconut and would like to try this. Hi Michelle, yes, the coconut rises to the top during baking and forms the top crust. If you don’t use it, it turns out more like an egg custard flan, which is also nice, but won’t be as firm. Hope that helps! I think Ttese would be good baked in a cookie shell.